Next week will mark the 67th anniversary of the taking of one of history’s most famous – and certainly one of its most reproduced — photographs. Shot by American Associated Press photographer Joe Rosenthal on February 23, 1945, it captured the remarkable image of six Marines from East Company raising the American flag on Mt. Suribachi, Iwo Jima. My friends and family know I love history. And I am a sucker for a good history story… especially if there are pictures to go with it! So on Monday I attended a lecture at Stanford University by Hal Buell, former head of the Associated Press Photo Service, and Author of Uncommon Valor, Common Virtue, the story of the Iwo Jima flag raising. Mr. Buell retraced the impact of the famed Iwo Jima photograph on Mr. Rosenthal, and America. The war in Europe was easy for Americans to understand and relate to. They could visualize – and had perhaps even visited — London, Paris or Berlin. The war in the Pacific, however, was waged on tiny islands most Americans had never heard of like Mindoro and Sulu Archipelago – with casualties that were inconceivably massive. Joe Rosenthal’s photograph helped provide context, understanding, and a desperately needed morale boost back in the U.S. It won the 1945 Pulitzer Prize, and Joe Rosenthal was awarded $1,000 (the only real money he every made from the photo). While Americans everywhere recognize Joe Rosenthal’s iconic photograph, many are unaware of the controversy that has surrounded it. It was not, in fact, a shot of the first flag raised on Iwo Jima. That original flag was photographed by military photographer Staff Sergeant Louis R. Lowery, but was lowered a few minutes later on the orders of the Secretary of the Navy who wanted it as a souvenir. Joe Rosenthal captured the raising of a second, larger flag. He happened to be in the right place at the right time, well after Lowery headed back down the mountain. Joe Rosenthal did not, as was often claimed, stage his photograph, nor did he try to cover up that there was a prior flag raising. Yet skeptics accused him of everything from planting the flagpole himself to stealing the film from the camera of a fallen Marine. Rumors were further fueled by a remark Mr. Rosenthal made before he’d learned that his flag-raising photograph had become a sensation in the U.S. When asked about the impact of the image, he assumed the question referred to his photo of Marines cheering alongside the already-raised flag (right), which he described as “posed”. Film footage of the flag raising from Sergeant Bill Genaust, a Marine motion picture photographer, bore out the photo’s authenticity, yet Life Magazine jumped on the story by accusing Rosenthal of staging on its radio show. Life later broadcast a retraction, but the damage had been done. Hollywood helped perpetuate other myths about the raising of the flag on Iwo Jima, often showing fierce Japanese sniper fire during the event – which never happened — and choosing macho actors like Lee Marvin to portray the humble real-life flag raisers. The Marine Corps War Memorial at Arlington National Cemetery was modeled after Joe Rosenthal’s photograph. When it was dedicated by President Dwight D. Eisenhower in 1954, participants from the first flag raising were in attendance and again expressed bitterness at the lack of recognition they had received. No reference was made to Mr. Rosenthal on the statue until 1978, when a plaque with his name was added to the monument. Given the frustration and humiliation his famous photograph sometimes brought him, Joe Rosenthal was often asked if he ever regretted taking it. Or, did he ever wish someone else had taken it? No, he replied. He did his job, and he was proud of the picture. 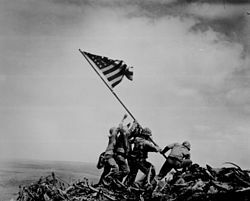 Besides, it didn’t matter that he took the photograph – what mattered was, the Americans took Iwo Jima. Well put, Joe.